I have been an outspoken critic of the F-35 programs and its massive cost overruns over the years. The F-35 is the Pentagon’s largest single program, and is likely to cost the government around $400 billion over the next 22 years. It has always bothered me that a single F-35 fighter plane costs between $100 and $200 million, and we’re buying 2,443 of them. How can that be? How can nobody in the government stand up to this and deal with it? Obviously, the military industrial lobby is extremely strong, so even Obama in his eight years didn’t stand up to it. The fact that nobody can even tell us exactly how much each plane costs is alarming. Try to google it! The difference between $100 and $200 million is $100 million. Do you realize how much good $100 million can do for our country? Do you realize how much good $100 million times 2,443 could do? Yet, we have no problem blowing that kind of money on a marginal and highly criticized program that may never even work. 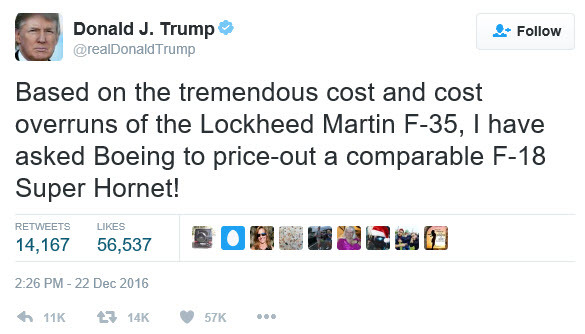 Trump, with his loose Twitter finger, has been poking and prodding Boeing about the cost of the new Air Force One 747 planes and Lockheed Martin about the F-35 and its incredible cost overruns. The stock of both companies declined immediately after he did that, and sure enough, the CEOs of both companies responded. It’s a little bit of a dance. But we’re going to get the cost down,” he said, calling the F-35 program “very, very—uhhh—expensive. Here is an article that provides a bit more background about the exchange between Trump and Hewson. 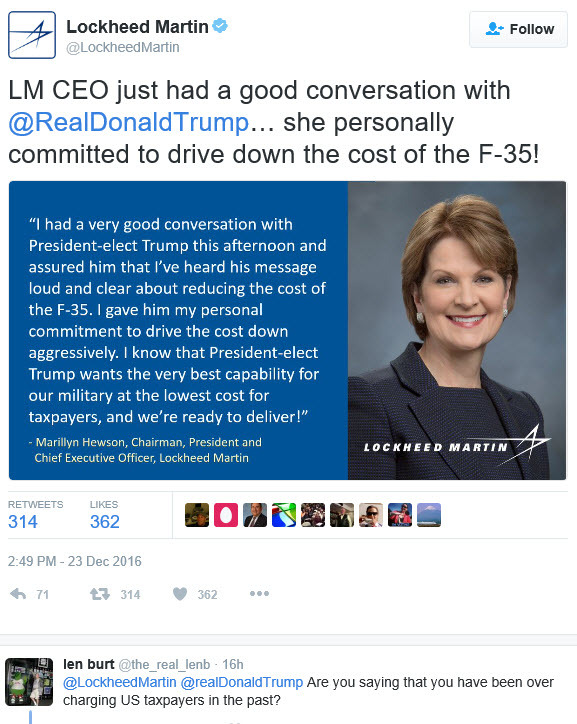 This concession by Lockheed Martin would never have happened without the brash and bold behavior of Donald Trump. I was hoping over the years that Obama would show backbone and stand up to this boondoggle. He didn’t. Bush before him didn’t. No modern politician did. I would venture to say that the word “F-35” never once got mentioned in any presidential debate by any candidate of either party. Lockheed Martin had (and still has) a steady stream of cash coming to it – a redistribution of wealth from the American taxpayer to the shareholders and executives of Lockheed Martin. We have been blaming Obama for being a redistributor, and we have pointed to the measly food stamps program that helps destitute Americans to get nourishment for their children. But right in front of our eyes, glaringly in the open, we have tolerated a redistribution program on a much grander scale – and nobody has spoken up. I have nothing but disdain for the man Donald Trump. But this is good. This little tweet of his might have been worth quite a few billions of dollars of American taxpayer wealth that can now go to more noble causes. Trump is the first politician in my memory that is standing up to the military industrial complex. And there you have it. I have posted in praise about Trump. I wonder what the person posting this is offering as an alternative? In his post, he is not offering anything. So I must assume that he advocates abolishing the food stamp program altogether. I have written plenty about food stamps in posts in this blog. Just search for Food Stamps and see. Here is one with statistics on the food stamp budget and the Afghan war. I have also analyzed the use of food stamps by state and have found the red states, where the politicians who condemn food stamps the most come from, are using food stamps almost at twice the rate as the blue states. Let’s for a minute ignore all the other myths being spread about food stamps and just focus on children. It’s not the fault of the children that their parents are poor. I myself grew up in a poor family, and I remember how scary it was as I got older and I realized that my mother often didn’t know where the next grocery purchase was coming from. So what are we suggesting we do with those children who are hungry? 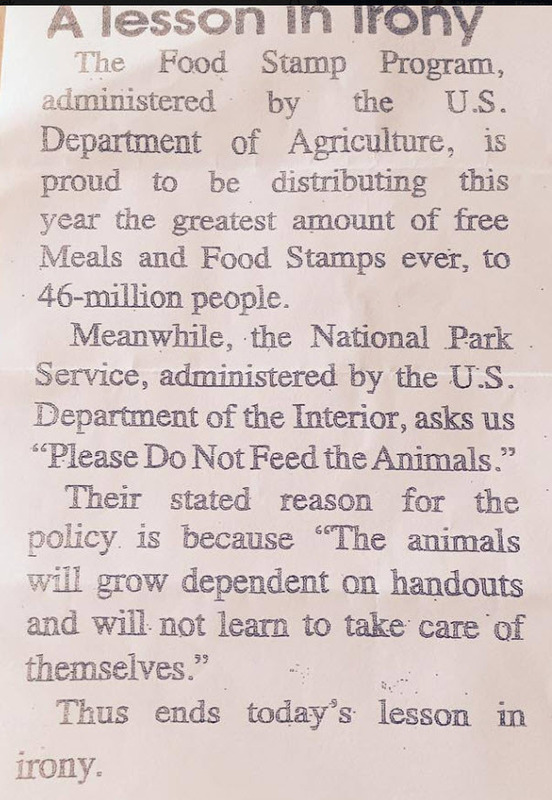 Don’t tell me that comparing feeding animals in National Parks is in any way related to hungry children. Wild animals forage and sustain themselves, or they die. When humans can’t forage and sustain themselves, before they die, they turn to crime. What other choices do they have? We can turn off the spigot of food stamps and see what happens. It won’t be pretty. Or we can keep our senses, remember to compare the food stamp budget to other insanities we spend billions of dollars on every month and year, and make an effort to force Wal-Mart and other companies to pay their employees adequately so they don’t have to rely on food stamps. Then we can focus on education of our children, and raising an educated generation with skills that the economy of the 21st century badly needs and is willing to pay for top dollar. But if we want our children to stay in school and pay attention, we must make sure that they are adequately nourished. And that is one of the reasons why we have a food stamp program. If you have other, better suggestions, I am listening. The gas mileage is about 1/2 or 1/3 that of conventional cars. For somebody driving all day long, that will make a huge difference. The engine is off when the car is standing, at a red light, or in traffic, or in a taxi line. It burns no gas and does not pollute when it stands. Toyotas just don’t break down. The reliability is phenomenal. I guess I am part of the Priushood. A single run of the Sunday New York Times uses up 75,000 trees. Every year when we get a delivery of telephone books I get angry, since I pick them up at the door and toss them straight into the recycle bin. What a colossal waste! They are printed and then distributed by hand to households. How expensive that must be. But nobody seems to use them anymore. 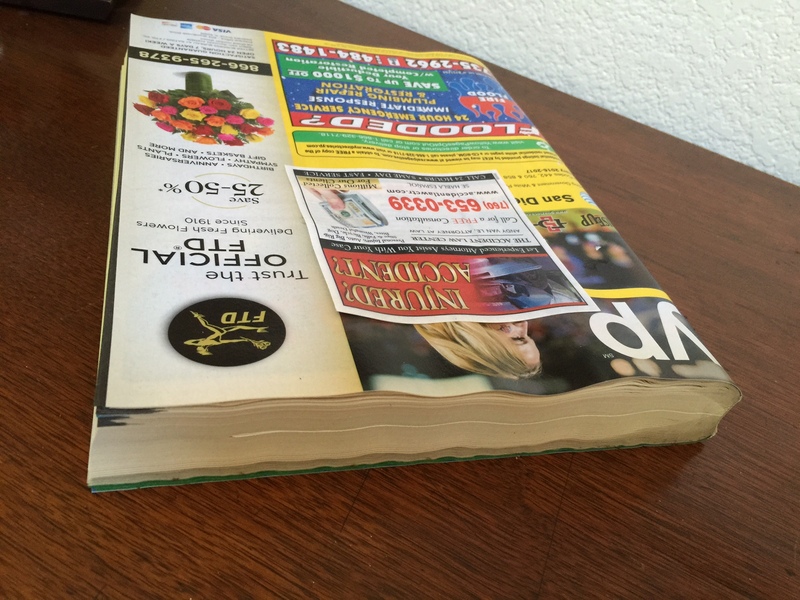 It’s been at least 20 years that I actually opened up a telephone book. But I get them every year. I got frustrated about this and checked online. Most of the links are about “recycling” phone books. What the heck? Why recycle. Why not just print stop printing them, and producing them on demand when somebody actually asks for one? Who is paying for this? I am sure we consumers are, somehow. Here is a site with Opt-Out information. I am registering myself right now. Will Apple Stop Selling iPhones in Switzerland? Switzerland just ruled that starting mid 2017, all smartphones have to use the same charger, thus minimizing electronic waste. I can see that this is a good idea. I don’t like to have all these chargers lying around. Yeah, that’s going to get attention. So Apple will change its design to accommodate Switzerland? My guess is that Apple will not care if 8,236,000 Swiss can buy iPhones. The Swiss market is too small to matter for Apple. The Swiss are just going to have to drive over to Austria, Germany, France or Italy to buy those. My guess is that their nearest Apple store is closer in those other countries than some Apple stores in American states like Idaho and Montana will be from many consumers. If you have traveled in Europe and stayed in a hotel, you might have noticed that they are usually very efficient with their room electricity. When you enter the room, right by the door, there is a slot for the magnetic room key card. You have to insert the card for the power in the room to work. All the outlets and lights are off without this switch. There is no way to bypass it. It’s also not possible to leave the room and leave all the power on. Recently we stayed at a Hilton hotel in Sacramento. It had such a slot that controlled the power in the room. It was the first time I had seen one of those in the U.S. However, the slot already had a key card in it. When we asked the attendant, she said that the rooms get hot with the air conditioning off, so they insert the keys so the power works and the air conditioning can be on. So why did they install the system in the first place, if they were not willing to use it the way it was intended to be used – to save power when the room is not occupied? That’s why the United States has less than 5% of the world’s population but uses 25% of the world’s energy. According to this article, Pepsi admitted that Aquafina is tap water. I try not to buy much bottled water, but in airports, and on road trips, I sometimes can’t avoid it. 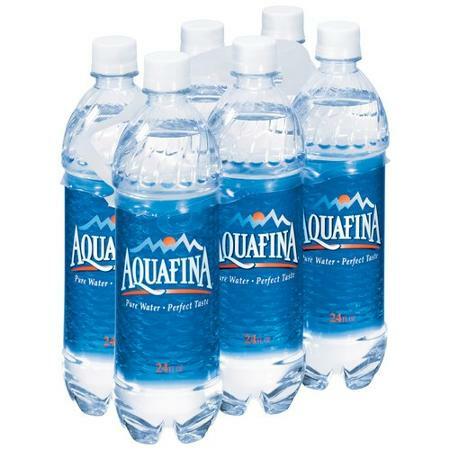 I like Aquafina because of their more sturdy, durable bottles, which I can refill – from tap water. Of course, the more durable bottles also use much more oil, and are much more likely to last millennia before breaking down – so they are much worse for the environment. I really should not be buying them. 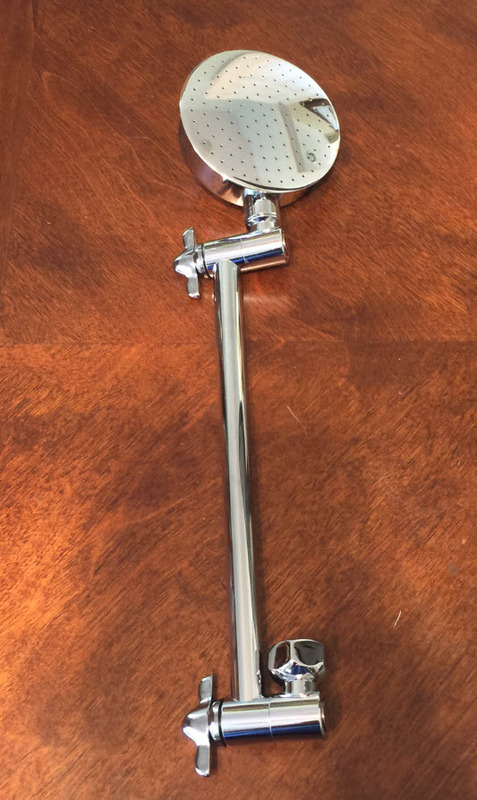 I have often argued that we should not be buying tap water. This admittance from Pepsi validates my opinion. 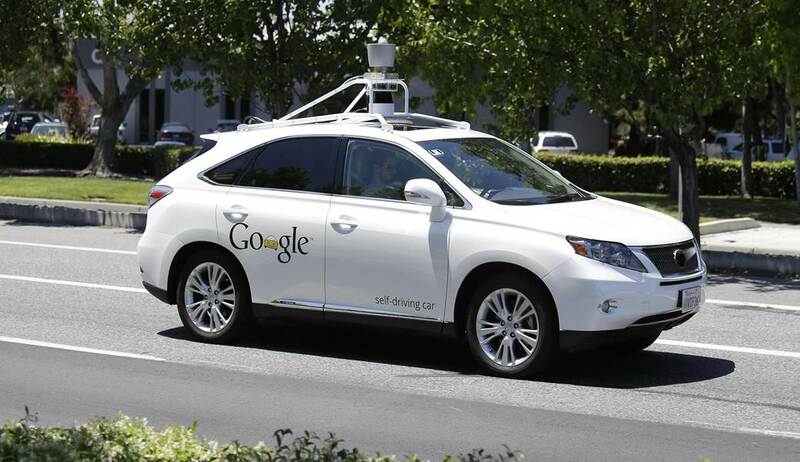 Earlier this year I posted some Ruminations on Self-Driving Cars. Last week, 60 Minutes broadcast a piece about self-driving cars, and the challenges automakers are facing. They focused on what the cars will be able to do, and how many deaths will be prevented. 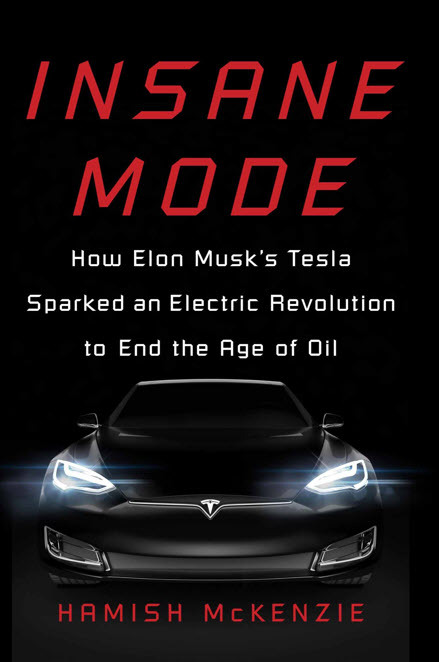 Tesla just announced that this coming Thursday, October 15, 2015, they will release the much-anticipated software upgrade version 7.0 for the Model S. This upgrade has many self-driving features, and Model S owners will now be able to drive hands free on highways. I actually believe that once self-driving cars become commonplace, they will have a much more profound impact on our lives than just relieving us from the daily chore of driving or reducing traffic accidents and fatalities. They will fundamentally change the way we live, the way our cities look, and the way we structure our societies. A similar change took place about 100 years ago when conventional automobiles took over the horse and buggy world. In New York City alone around 1900, we estimate that there were 170,000 horses at any time. The horses were worked in 12-hour shifts. Horses defecate every 2 hours and urinate every 3-4 hours. All this went onto the city streets. There were workers called “dirt carters” that picked up the manure from the streets and hauled it to specially designated “manure blocks.” Imagine the flies and vermin this attracted. In the winter, the frozen waste was covered by layers of ice and snow, and the streets sometimes rose up by several feet, as this built up. Imagine the stench and mess when the spring thaw came around. When horses died, as all living things do eventually, they were often left on the streets until they were rotted sufficiently so they could be taken away in pieces. While they were there, children played with the carcasses. Behind every house, there was a stable. When citizens wanted to travel, they had to get the horseman to prepare the team. Horses needed to be cared for and fed daily. Only the richest could afford horses – and therefore transportation. This changed rapidly when cars come along. The advent of self-driving cars will once again change the way we live and travel as fundamentally as the change from horses to cars did. When we can summon our cars using a mobile app on our smart-phones, similar to how we can hail an Uber car right now, we really won’t need parking lots anymore at work places, airports, train stations, shopping malls or restaurants downtown. We will simply have our cars drop us off at the front door wherever we are going. Then the car will drive away to a parking garage that’s designed just for cars. Cities will be clean. The streets will no longer be littered with parked cars on both sides. The only cars on city streets will be those that are on their way to drop off or pick up their passengers. They will park in peripheral facilities away from the human activity. We hail our cars when we need them, and send them away when we don’t have use for them. That, of course, begs the question: Why would anyone still “own” a car? We really don’t spend enough time in our cars to warrant having them sit in our garages all the time, like the horses waited in the stables behind the houses of yesteryear. Imagine requesting cars of varying luxury and grades. If we just want to go down the street to the mall for a couple of miles, we might get an entry-level car, just for transportation. It would be very cheap. However, if we are planning on a 45 minute drive downtown to the Opera, we might get a luxury model with leather couches, a bar and a high-end sound system. There would be no need to own either. We would just use them when we needed them. Car ownership, car maintenance, use of energy, expedience of transportation, quality of the ride, quality of the air we breathe, cityscapes, inner-city ambiance and the structure and construction of office buildings, all will change rapidly because cars drive themselves. We will watch old movies of 2015 and it will seem as quaint as westerns look to us now. That’s how we will think about the days when we still had to drive our own cars. Changing the Earth without Changing the Climate? Here are some examples of where man has changed the face of the globe. It’s called manmade change, or anthropogenic change. There is no doubt that this was done by man. The picture below shows the Neza Chalco Itza slum with its epic 4 million inhabitants. It is the world’s largest slum and has the highest crime rate in Mexico. 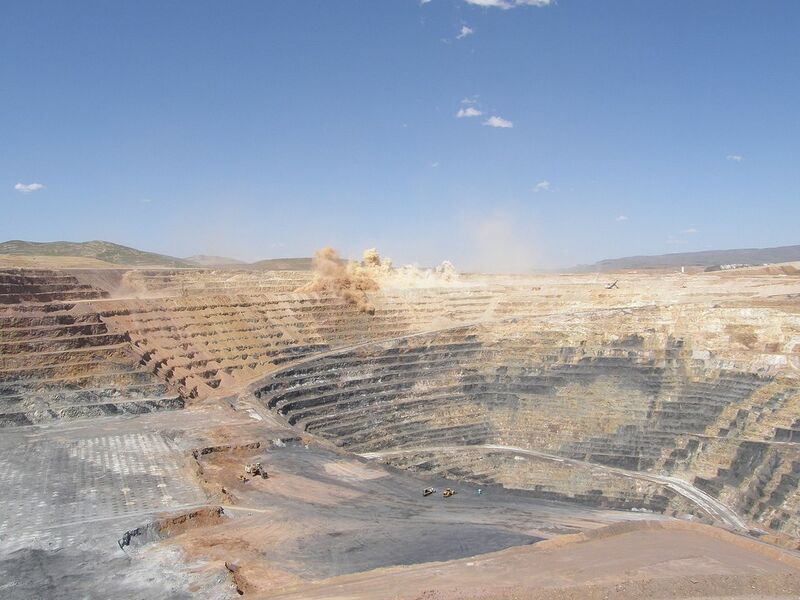 Here is the Twin Creeks gold mine in Nevada. 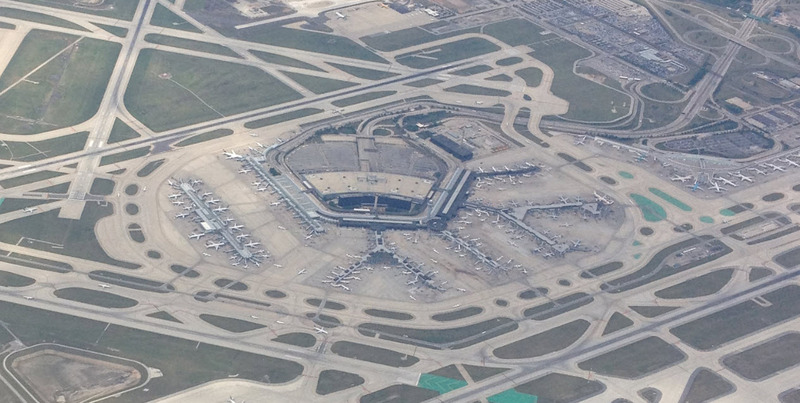 Then finally, a picture of the Chicago O’Hare airport that I took myself a few years ago. These are visible, tangible examples of anthropogenic change in the Earth. I know this is anecdotal and not very scientific, but given these visible examples of what humanity has done to the planet, do we really want to believe that we didn’t modify our air just as drastically? Too bad we can’t see the CO2, and what it does to the planet. We’ll just have to wait a hundred years when our grandchildren won’t be able to walk in lower Manhattan or when most of coastal Florida will be under water. Let’s not even talk about New Orleans. I wonder what our descendants are going to say in 2100, when they watch the 2015 videos of Marco Rubio or Scott Walker saying that they were not willing to jeopardize oil or coal mining jobs or have the price of gas rise, in the face of this hoax? In the last several days I attended APHSA-ISM, a conference of human services administrators from all over the U.S. and the IT industry at the Philadelphia Convention Center. One of the beneficiaries we raised funds for was Philabundance, a local food bank. A few hours after we saw the heartbreaking marketing video of Philabundance, we attended the first conference luncheon. The ballroom had round tables for over 1,000 attendees, each table with nine chairs. Many tables were not full. There were only six people at ours. The meal was family style. The waiters brought dishes of food and we served ourselves. 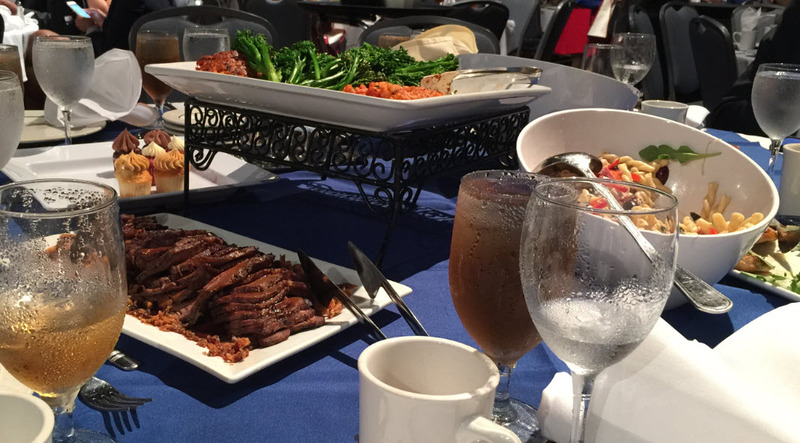 Our table had large bowls of green salad and a pasta/ham salad, a basket of bread, a plate of chicken breasts, a plate of beef, and a large platter of some type of rice cake. Our table had food for at least 20 people. The beef dish wasn’t even touched. One of us took a single slice just for a taste. Then there was a plate of cupcakes for dessert of which we didn’t consume half. None of the dishes were even half empty as we all walked out of the room. This was only our table. There were over a hundred more in the room. I do not know what the hotel did with the food that got removed from the tables. It was enough to feed an army. I do not have the solution; none of us in the room did, even though these were the people from around the country who have to administer food stamp programs, whose job it is to worry about the most vulnerable members of our society – hungry children. This was a drastic reminder of the inequality in our country. Why do I get to eat in abundance in an air-conditioned ballroom, while 16 million kids in America aren’t getting the food they need?